It has been six years since the Zimbabwean economy recovered from a decade-old recession. But now, as the growth falters, Zimbabweans are worried about another looming economic stagnation. In 2008, shops ran empty forcing Zimbabweans with money to shop in South Africa, Mozambique and Botswana; inflation rose to 231 million percent on the last count; public institutions such as hospitals and schools survived on shoe-string budgets; and companies either closed down or operated at below capacity utilization levels. These memories have sprung back to life and many people are now in a state of despair with about 20,000 in formal employment having lost their jobs in less than a month; hundreds of vendors thrown off the streets; factories struggling with rising costs at home and plunging international commodity prices. Finance Minister Patrick Chinamasa dismissed claims that the economy was sinking, suggesting instead that the old formal economy was dead and a new one hinged on the informal sector was emerging. However Chinamasa has revised the 2015 GDP growth downwards from 3.2 percent to 1.5 percent, saying this has been prompted by a poor agricultural season. “Overall performance during the first half of the year indicates some modest growth, particularly in the sectors of mining, manufacturing, tourism, construction, finances as well as public services. “However, their contribution to the original growth projection of 3.2 percent is being weighed down by the drought induced under-performance of agriculture,” Chinamasa said as he presented the mid-term fiscal policy statement end of July. He said the slowdown in economic activity will have a bearing on the country’s public finances, as well as the balance of payments. Price declines are expected to prevail during the remaining part of the year, with average annual inflation for 2015 now projected at -2 percent against the original projection of -1 percent. The Reserved Bank of Zimbabwe said early August that the central bank had mobilized 210 million dollars from development banks for channelling to local industries to boost production. But as prices continue to fall, many people are finding it difficult to get the cash to buy essential commodities and sustain their lives. 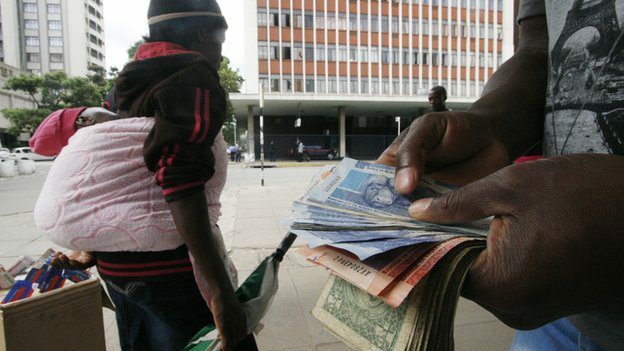 A Harare worker said her bank had refused to approve her application for a loan because of the on-going mass dismissals of workers by employers. “I was told that there was no guarantee that I would still be employed by the time the loan is due,” she said.